Happy new Samsung tablets day! Although the Korean chaebol isn't churning out Galaxy Tabs quite like it used to, it did take the time to showcase the brand new Galaxy Tab A and Tab A Plus tablets in Russia. They belong to the A-series of "mid-range-premium-built" devices which you may know from the Samsung Galaxy A3, A5, and A7 smartphones. Thus, the Galaxy Tab A and Tab A Plus sport slim chassis 0.29in (7.5mm), and although we can't discern surely from photos alone, they appear to have the nice polished aluminum build too! Here's how they fare in terms of specs. 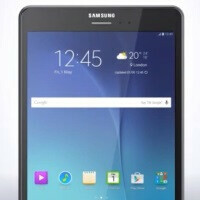 The Galaxy Tab A has Wi-Fi/Cellular variants and it has an 8-inch 1024x768 display (4:3 ratio), a Qualcomm Snapdragon 410 processor (but other sources cite an "unknown Cortex-A53 CPU" as the player, so the possibility for Samsung silicon stays), 1.5GB of RAM, 16GB of storage, a 5MP main camera (there's a cam on the front too), and a 4200mAh battery. The Galaxy Tab A Plus, which too has Wi-Fi and Cellular variants, has a 9.7-inch 1024x768 display (4:3 ratio), a Snapdragon 410 processor, 2GB of RAM, 16GB of storage, a 5MP main camera (there's one on the front too), a 6000mAh battery, and it includes an S-Pen stlyus with the related functionality. The tablets could show up on the market in May, with price tags expected to be similar to the current Galaxy Tab 4 tablets (about $199 - $349). Hopefully, Samsung will follow up with an official announcement. This has all of the specs from 2-3 years ago. Camera bump on a 5mp camera and a 4:3 ratio for all those TV shows from the 90's. I have a galaxy tab pro so not a hater. Nice resolution. Just needs the price to be up $250! 100% equal to the iPad which is also equally as ugly. Having had the Tab S, this is a huge step backwards by Samsung. All they had to do was lower the cost of the Tab S to match the iPad and it would have increased sales. The Tab S was 479 when I bought it. Even though the iPad starts at 499 and the Tab was cheaper, Samsung could have went lower to increase sales. The Tab S was nearly perfect. The only problem was CPU wasn't powerful enough and the device would freeze often based on my usage which was fairly light. The specs are more low-end than midrange, especially in this tablet segment. Fuuuuuuuu. Samsung buttons are bad for tablets. Also that bezels. what? A Plus includes S-Pen stylus?? So...what's the point of Note line now, if they include S-Pen stylus in mainstream devices...??!?! what? and that resolution, HORRIBLE. we're going back to iPad/iPad 2 generation, I guess. It's a huge pass for me. Looks like a Note 3!